“Basic Witch” is a delightful Cozy Mystery about a girl, Gemma Bradbury, and her cat, Titus, who fall into a magical world which is inhabited by creatures of fairy tales and folk lore. Gemma finds out through the Witch’s Coven that, not only is she stuck in this strange place, but she’s a witch and Titus is her familiar. If that’s not enough, she is accused of murder by an oaf of an detective. While she’s learning how to use her new skills she, along with her new friends (who are great characters, by the way), try to clear her name. Ms. Hart has a style and imagination to be envied by other writers of the genre. I truly enjoyed this, sometimes laughing right out loud. I gave this book 5 stars and I can’t wait to read Book 2 of the series. 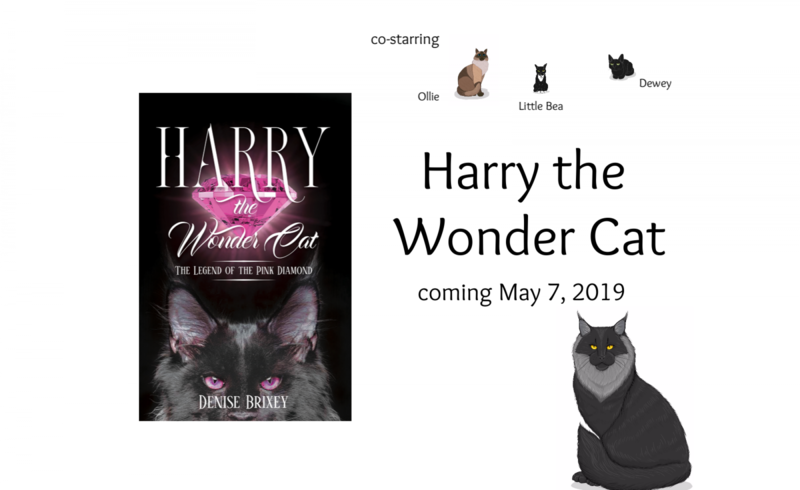 As most of you already know, I’m writing a series of cozy mysteries called Harry the Wonder Cat Series. Unfortunately, the picture that we chose to be Harry was copyrighted. As a result, the position of Harry has opened up again. If you want your cat to be a star, send a head shot and a full body shot to denisebrixey@gmail.com. Please label your email Harry the Wonder Cat pics. Head bonks and kitty kisses from Harry and the management.